We came to Abou Simbel on the night of the 31st January, and we left at sunset on the 18th February. Of these eighteen clear days, we spent fourteen at the foot of the rock of the Great Temple, called in the old Egyptian tongue the Rock of Abshek. The remaining four (taken at the end of the first week and the beginning of the second) we passed in the excursion to Wady-Halfeh and back. By thus dividing the time, our long sojourn was made less monotonous for those who had no especial work to do. Meanwhile, it was wonderful to wake every morning close under the steep bank, and, without lifting one’s head from the pillow, to see that row of giant faces so close against the sky. They showed unearthly enough by moonlight; but not half so unearthly as in the grey of dawn. At that hour, the most solemn of the twenty-four, they wore a fixed and fatal look that was little less than appalling. As the sky warmed, this awful look was succeeded by a flush that mounted and deepened like the rising flush of life. For a moment they seemed to glow to smile to be transfigured. Then came a flash, as of thought itself. It was the first instantaneous flash of the risen sun. It lasted less than a second. It was gone almost before one could say that it was there. The next moment, mountain, river, and sky, were distinct in the steady light of day; and the colossi mere colossi now sat serene and stony in the open sunshine. Every morning I waked in time to witness that daily miracle. Every morning I saw those awful brethren pass from death to life, from life to sculptured stone. I brought myself almost to believe at last that there must sooner or later come some one sunrise when the ancient charm would snap asunder, and the giants must arise and speak. Stupendous as they are, nothing is more difficult than to see the colossi properly. Standing between the rock and the river, one is too near; stationed on the island opposite, one is too far off; while from the sand-slope only a side-view is obtainable. Hence, for want of a fitting standpoint, many travellers have seen nothing but deformity in the most perfect face handed down to us by Egyptian art. Viewed from below, this beautiful portrait is foreshortened out of all proportion. It looks unduly wide from ear to ear, while the lips and the lower part of the nose show relatively larger than the rest of the features. The same may be said of the great cast in the British Museum. Cooped up at the end of a narrow corridor and lifted not more than fifteen feet above the ground, it is carefully placed so as to be wrong from every point of view and shown to the greatest possible disadvantage. The artists who wrought the original statues were, however, embarrassed by no difficulties of focus, daunted by no difficulties of scale. Giants themselves, they summoned these giants from out the solid rock, and endowed them with superhuman strength and beauty. They sought no quarried blocks of syenite or granite for their work. They fashioned no models of clay. They took a mountain, and fell upon it like Titans, and hollowed and carved it as though it were a cherry-stone, and left it for the feebler men of after-ages to marvel at for ever. One great hall and fifteen spacious chambers they hewed out from the heart of it; then smoothed the rugged precipice towards the river, and cut four huge statues with their faces to the sunrise, two to the right and two to the left of the doorway, there to keep watch to the end of time. These tremendous warders sit sixty-six feet high, without the platform under their feet. They measure across the chest twenty-five feet and four inches; from the shoulder to the elbow, fifteen feet and six inches; from the inner side of the elbow joint to the tip of the middle finger, fifteen feet; and so on in relative proportion. If they stood up, they would tower to a height of at least eighty-three feet, from the soles of their feet to the tops of their enormous double-crowns. There is but one hour in the twenty-four at which it is possible to form any idea of the general effect of this vast subject; and that is at sunrise. Then only does the pure day stream in through the doorway, and temper the gloom of the side- aisles with light reflected from the sunlit floor. The broad divisions of the picture and the distribution of the masses may then be dimly seen. The details, however, require candle-light, and can only be studied a few inches at a time. Even so, it is difficult to make out the upper groups without the help of a ladder. Salame, mounted on a chair and provided with two long sticks lashed together, could barely hold his little torch high enough to enable the Writer to copy the inscription on the middle tower of the fortress of Kadesh. It is fine to see the sunrise on the front of the Great Temple; but something still finer takes place on certain mornings of the year, in the very heart of the mountain. As the sun comes up above the eastern hill-tops, one long level beam strikes through the doorway, pierces the inner darkness like an arrow, penetrates to the sanctuary, and falls like fire from heaven upon the altar at the feet of the Gods. No one who has watched for the coming of that shaft of sunlight can doubt that it was a calculated effect, and that the excavation was directed at one especial angle in order to produce it. In this way Ra, to whom the temple was dedicated, may be said to have entered in daily, and by a direct manifestation of his presence to have approved the sacrifices of his worshippers. 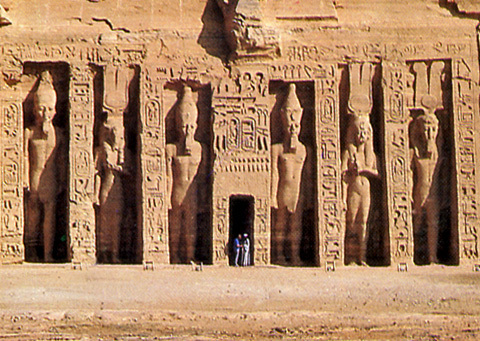 To come out from these black holes into the twilight of the Great Hall and see the landscape set, as it were, in the ebon frame of the doorway, was alone worth the journey to Abou Simbel. The sun being at such times in the west, the river, the yellow sand-island, the palms and tamarisks opposite, and the mountains of the eastern desert, were all flooded with a glory of light and colour to which no pen or pencil could possibly do justice. At this juncture, seeing that the men s time hung heavy on their hands, our Painter conceived the idea of setting them to clean the face of the northernmost Colossus, still disfigured by the plaster left on it when the great cast was taken by Mr. Hay more than half a century before. This happy thought was promptly carried into effect. A scaffolding of spars and oars was at once improvised, and the men, delighted as children at play, were soon swarming all over the huge head, just as the carvers may have swarmed over it in the days when Rameses was king. These monuments do not belong solely to the countries who hold them in trust. The whole world has the right to see them endure. Through this restoration of the past, we have indeed helped to build the future of mankind.